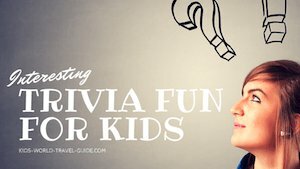 On this page you will find information on food in France for Kids. 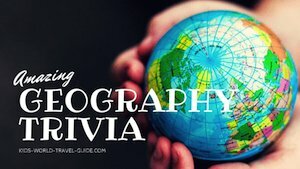 Often we are asked which food to try when in France or which French food is really popular also with kids. 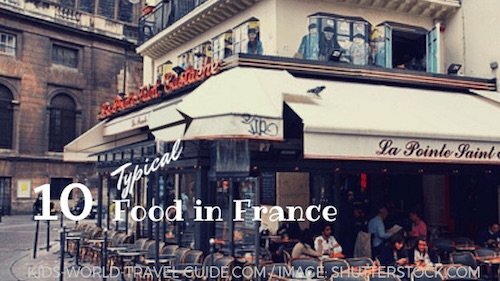 So here we share information on typical Food in France. The French love eating out, so everywhere you encounter bistros, bars, streetside cafes and restaurants. 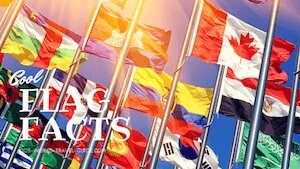 In France, there are many traditional dishes, some of which you might know as they are popular all over the world. So read our article and learn about the typical French food dishes or know what to order next time you are in France or in a French restaurant. And enjoy the meal! or Bon Apétit! as the French say. 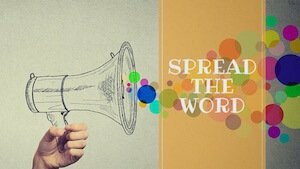 Let's start with something sweet! Macarons are the delicious sweet cookies filled with butter cream. 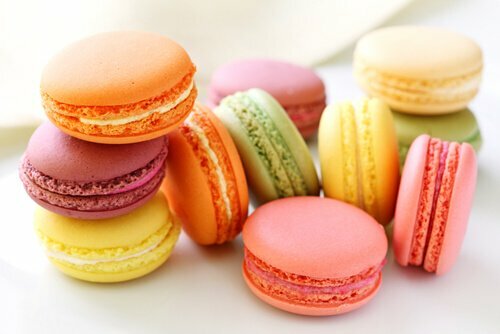 Macarons come in many colours so you can distinguish on the taste of the filling such as pink for raspberry taste, brown for chocolate, yellow for vanilla or lemon, green for pistachio, blue for ...blueberry... and mmmh, the French macaroons melt in the mouth! 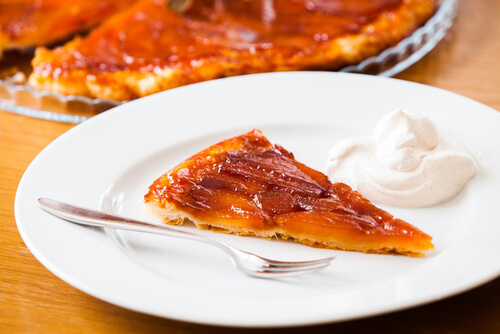 Another typical treat for all with a sweet tooth is Tarte Tatin. This 'upside-down' apple tart made with apples which were caramelized in butter and sugar before baking. Our favorite French sweet treats are crepes. 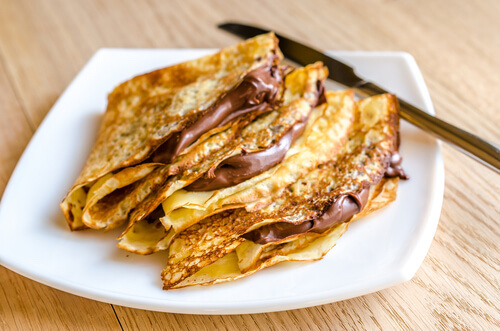 The French pancakes are very thin and -this is our favourite- filled with chocolate sauce or fresh fruits. Sometimes they are enjoyed with savoury fillings. Crepes are very tasty, even when only sprinkled with sugar and folded. The French bread loaf is long and thin. 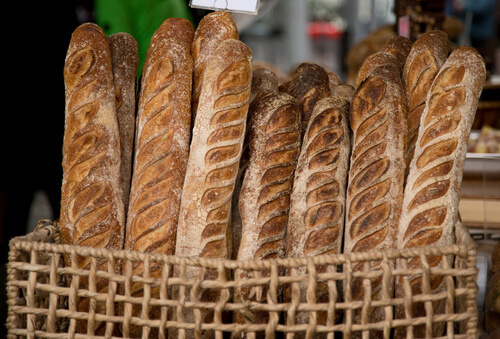 This typical French bread is made mainly with white wheat flour but any French bakery (boulangerie) will have many different types of baguette for you to choose from. Now there are also baguettes made out of rye flour, spelt flour or whole wheat flour. 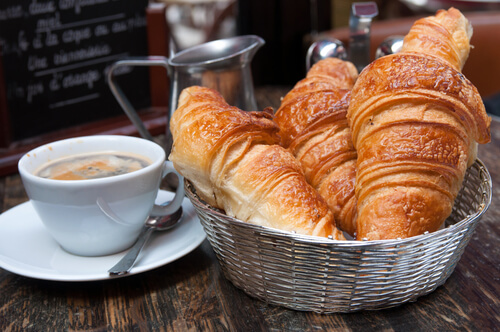 Croissants are typically used for breakfast, but can also be eaten filled with ham and cheese for a more filling meal later during the day. The French are known for their love of cheese. 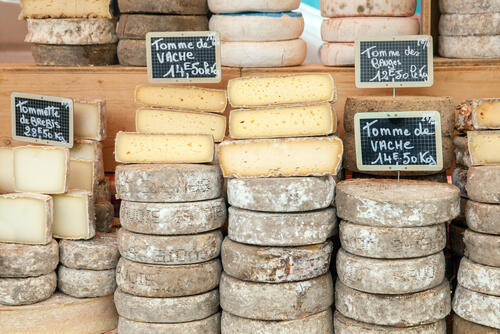 There are many delicious cow's milk cheeses ('fromage de vache'), but also goat's milk cheeses ('fromage de chevin'). 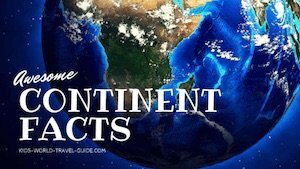 Camembert, Brie and Roquefort (blue cheese) are some of the best known cheeses and eaten all over the world. 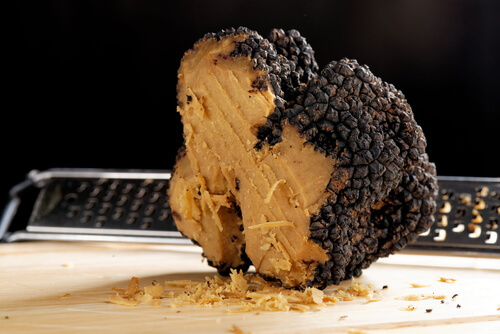 Truffles are rare kind of mushrooms. 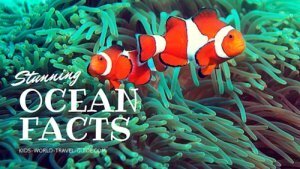 They are very expensive, so only small quantities are used. The dried truffles are grated or sliced over pasta and meat dishes or added to sauces, salads or soups. This mushroom grows near oak and hazelnut trees. Bouillabaisse is seafood stew and typically made with fresh bony fish, shellfish, mussels, vegetables, herbs and olive oil. 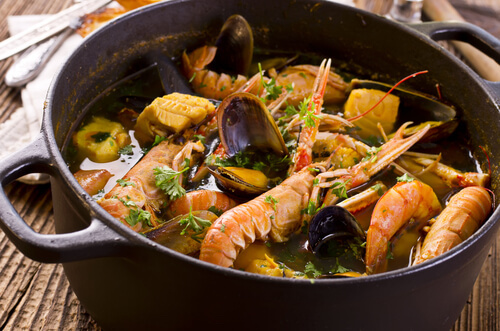 The origins of the dish are the fish stews cooked by the fishermen in Marseilles who used to cook big pots of fish and let the stew boil and then simmer for a long time before eating the meal together with their friends and families. 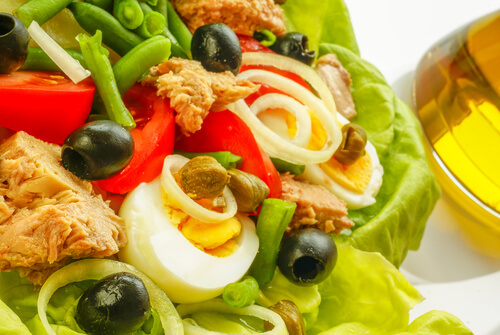 This typical French salad includes lettuce, canned tuna, black olives, tomatoes, onions, hard boiled eggs and sometimes anchovies, caper berries and green beens. It is named after the city of Nice and thus the name means 'Salad from Nice'. It is either eaten on its own as a light meal or as a starter. 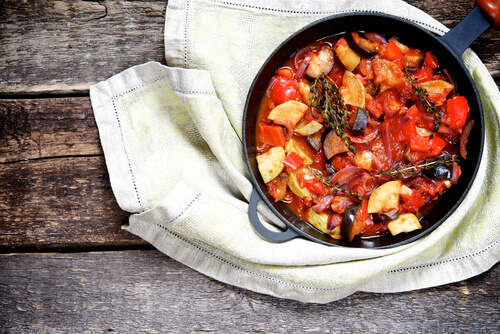 Ratatouille is a thick stew including tomatoes, bell peppers, onions, garlic, courgettes (also called zucchini) and aubergines (also called eggplants). It is usually mainly eaten as vegetable stew, but there are variations which also include meat. 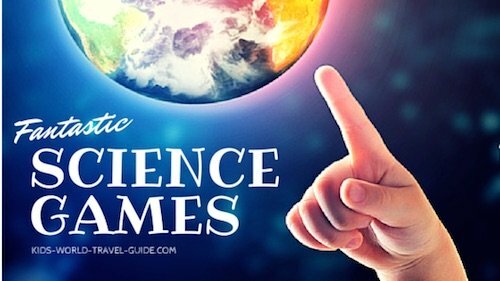 Follow Kids World Travel Guide's board France for Kids on Pinterest.